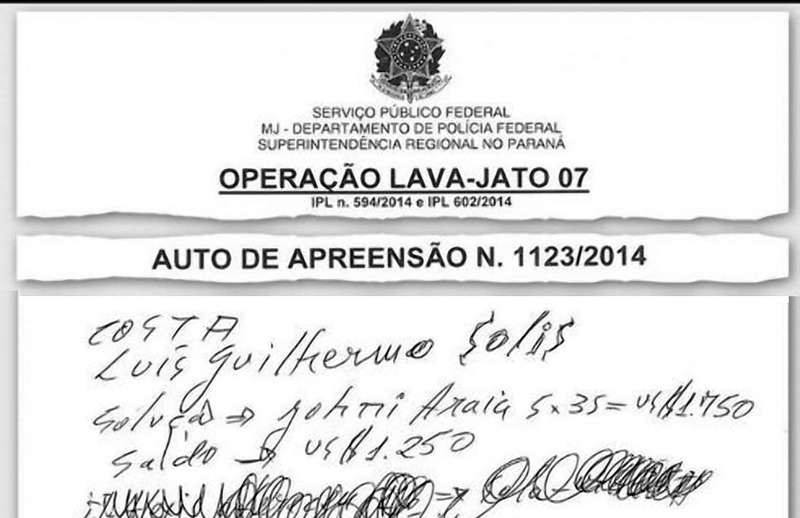 The names of Costa Rica’s President Luis Guillermo Solís and former National Liberation Party (PLN) presidential nominee Johnny Araya were among several prominent figures listed on a handwritten note allegedly redacted by José Aldemário Pinheiro Filho, the president of Brazilian contractor OAS and a target of an ongoing corruption investigation in the South American country. The note was seized by Brazilian police in São Paulo, and some of the names have dollar figures written next to them, the Brazilian newspaper Valor Econômico reported on Tuesday. Solís’ name does not have any dollar figures scribbled next to it, but Araya’s does. Also on the list is Guatemalan President Otto Pérez Molina. The Costa Rican government paid OAS $35 million ($6.5 million in December 2013 and $28.5 in March 2014) during President Laura Chinchilla’s 2010-2014 term as part of a settlement for a canceled $524 million San Ramón Highway concession. According to Valor Econômico, the document seized at Pinheiro’s home suggested that he had set aside more than $1 million for Antonio Solá, a Spanish political campaign consultant overseeing Alejandro Sinibaldi’s bid for president of Guatemala in November 2015. Solá also worked as a campaign consultant for Haitian President Michel Martelly and former Mexican President Felipe Calderón, the newspaper noted. Sinibaldi served as one of Pérez Molina’s ministers from January 2012 to September 2014, when he announced his candidacy. As of Monday, Pinheiro was ordered to be held in preventive detention while Brazilian prosecutors investigate allegations of money laundering, organized crime and corruption. He is one of 36 suspects in the case. Documents federal police seized allegedly show that Pinheiro sought billion-dollar contracts in the construction of ports, airports, water management systems, hydroelectric dams, highways and rail projects in Central and South America, the Caribbean and Africa, Valor Econômico reported. President Solís issued a statement Tuesday afternoon denying any involvement with the investigation and OAS. “The Presidency of the Republic of Costa Rica categorically rejects any insinuation that attempts to draw a relationship with an article in circulation and an investigation underway in Brazil,” the statement said. Solís’ ruling Citizen Action Party (PAC) issued a second statement rejecting any connection between the president of Costa Rica and the OAS investigation. The PAC statement cited former campaign treasurer Leda Zamora as saying that Solís’ presidential campaign did not accept any money from corporations, legal entities (personas jurídicas) or any foreign donors in accordance with Costa Rican election law. Valor Econômico said it had not received comment from the Costa Rican consulate in São Paulo. Araya told the news website crhoy.com that he did not know why his name was on the document, and he denied knowing Pinheiro. He said he had no knowledge of what the figures next to his name meant. The Tico Times spoke with Araya’s former campaign manager, current PLN lawmaker Antonio Álvarez Desanti, who said Tuesday night that Araya’s campaign did not receive funds from OAS. “Johnny [Araya] spoke out against the [San Ramón Highway] project, which put him at odds with President Laura Chinchilla. It would seem strange to me to reject the project if the campaign received funds,” Álvarez said. Álvarez added that he had not spoken to Araya about the OAS investigation or why his name appeared on the document. An ethics investigation ultimately cleared President Chinchilla of any wrongdoing in the granting of the San Ramón concession to OAS. In August, a report by Costa Rica’s Comptroller General dismissed allegations that former Public Works and Transport Minister Pedro Castro, also a former OAS consultant, had used his office to influence the San Ramón Highway contract. With friends like these, did Johnny need enemies?